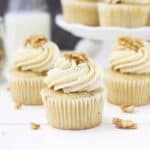 These Maple Walnut Cupcakes with Brown Butter Frosting are the perfect combination of a moist vanilla cupcake infused with real maple syrup and buttery walnuts. The brown butter frosting adds to the overall nutty finish of these cupcakes. In a large mixing bowl, combine the sugars, vegetable oil, eggs, sour cream, maple syrup and vanilla extract. Beat on medium speed until well combined. Scrape down the bowl as needed. Add the dry ingredients and the milk and continuing beating until the flour is well incorporated. Scrape down the sides of the bowl and add the chopped walnuts and stir to combine. Bake at 350°F for 14-15 minutes. Test the cupcakes for doneness by inserting a toothpick into the center of the cupcake. If the toothpick comes out clean, the cupcakes are done. Cool Completely. For the frosting: To brown the butter, use a small saucepan, and cut the butter into pieces. Melt the butter over medium heat and allow it to boil and bubble. Once it’s starts boiling, stir it frequently and it will slowly start to turn an amber color and releases a nutty aroma. Remove the butter from the heat and allow it to cool completely. Cut the remaining cold butter into pieces. Using the paddle attachment of your stand mixer, whip the butter for 2-3 minutes, scraping down the bowl occasionally. Beat until the butter looks light in color. Add 2 cups powdered sugar and mix on medium speed until the powdered sugar is incorporated into the butter. Next, add the remaining powdered sugar, maple syrup and cooled brown butter into the frosting and beat it into the butter until the frosting is completely smooth. Then beat it at a high speed for 1 minute to whip some additional air into the frosting. Pipe the cupcakes using a large open star tip and top with a walnut. These are best served fresh. The frosting will firm up the longer it set.